FairlawnGig® is a municipal broadband utility established by the City of Fairlawn that delivers a better Internet experience for residents and businesses in Fairlawn and the Akron/Bath/Fairlawn JEDD. 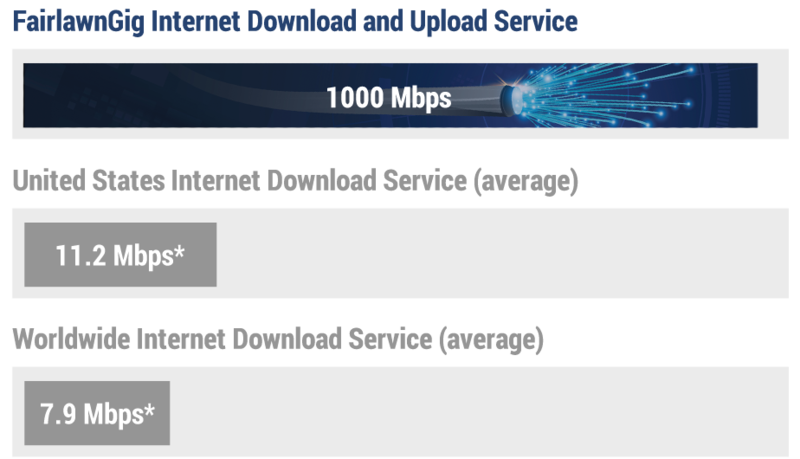 FairlawnGig’s high-speed fiber network offers an unprecedented level of Internet service to the Fairlawn area with a gigabit fiber connection to every home and business. The City of Fairlawn established FairlawnGig as a forward-thinking, economic development strategy founded on the belief that business growth, innovation, and community transformation will follow with every connection. FairlawnGig delivers blazing fast Internet access – incredible performance, unmatched reliability and exceptional value. Gigabit Internet access is delivered over our 100% fiber network. FairlawnGig offers both residential Internet and specialized business Internet services. There are no equipment fees, no data caps and no long-term contracts. An exceptional Internet connection improving everyday life and growing business opportunities! Check to see if we can provide our services in your area. Call us at 330-668-3300 or emails us at info@fairlawngig.net to learn how to experience superior broadband in your home or business. Upgrade to gigabit speeds and a more reliable network from a local provider you know and trust.